Since the fall of the Soviet Union, the methods of dispute resolution in Central and Eastern Europe have changed dramatically. No longer intended to serve a monolithic state, courts and arbitration institutions have adapted to permit the resolution of commercial disputes that now arise. No other book offers this view of the function of courts and arbitration in these regions. 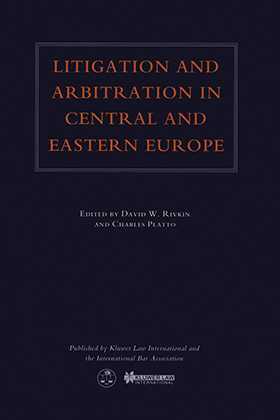 Using the resources of the International Bar Association, the volume provides separate reports on litigation and arbitration by experts in Russia, Hungary, Poland, and the Czech Republic, plus additional chapters on Slovakia, Slovenia, and Estonia. This practical text sets out the relevant material in a straightforward manner and also provides illuminating comparisons. Numerous appendices aid its usefulness as a resource. These helpful features and this new book's singularity in the field make this essential reading for practitioners in the region, whether their work involves commercial transactions or dispute resolution.